A cornucopia of behind the scenes pictures, the 2011 book “Alfred Hitchcock” (subtitled “The Complete Films” on the cover and “Architect of Anxiety” inside) lives up to the reputation of its publisher, Taschen, as a book that’s first and foremost a thing of beauty. 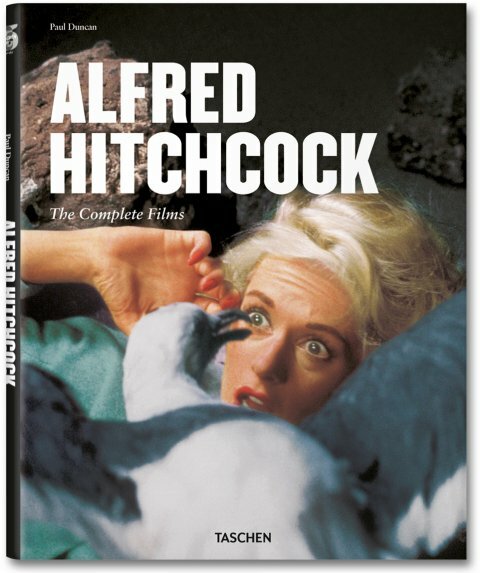 Written by Paul Duncan, the book groups Hitchcock’s films by era and examines each – sometimes a bit too briefly – mining for theme and symbolism. Duncan lays on the interpretations of these themes a bit thick, however; every time a film features a character in handcuffs, he points out the other instances of handcuffery in Hitchcock’s films in an effort to make the reader tune in on it as a theme – and yes, handcuffs do appear in several Hitchcock films, but to my mind, when one directs thrillers, they are a part of the larger milieu. 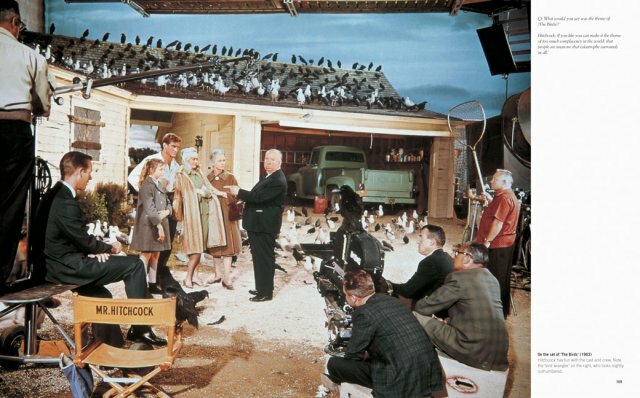 One of the many behind the scenes images in "Alfred Hitchcock"
images are often spectacular in their clarity, especially in the early films, where all we have to watch are scratchy prints. Many of the shots encompass the entirety of the set, including Hitchcock and his crew, and even reveal secrets of the Master’s technique. The sheer number of photos that include Hitchcock remind us that despite his weight, Hitchcock was an active, physical director. It was only as he grew older that he cultivated the image of himself as something of an immovable object. Still, there are many, many images here that most people will not have seen before, and they are reproduced so lovingly that “Alfred Hitchcock” is a book worthy of your Hitchcock bookshelf. You can order it here.